Crown Oil UK are Trusted by Businesses across the UK to Supply Red Diesel and White Diesel (Derv) with Same Day and Next Day Deliveries available Nationwide throughout the UK. Red Diesel is a low-duty form of Diesel Fuel, also known as Gas Oil, Tractor Diesel, Agricultural Diesel, Generator Fuel, 35-Second Oil and Cherry Fuel. Not only can we get you great prices for your supply, but we can deliver it quickly, with over 92% of our deliveries arriving within 24 hours. If you need to order Red Diesel, you can do so by giving the team here at Crown Oil UK a call on 0845 130 9777. They’ll be able to answer any questions and give you an up to date quote. In an emergency and need an urgent delivery? 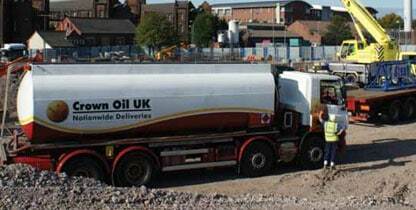 We can deliver fuel to your business within a matter of hours. For more information on our rapid-response deliveries, click here to read about our emergency delivery service. Telephones manned 24/7 and 365 days a year with just one number to call, 0845 130 9777. Order volumes ranging from a 205-litre Gas Oil Barrel to a 36,000-litre Fuel Tanker. You’ll gain access to our free fuel management service, where we’ll shoulder the burden of managing your future Gas Oil deliveries. A full range of fuel storage tanks, pumping and dispensing products, environmental control products and technical advice are available. Gas Oil is minimally taxed and its use is strictly confined to off-road, untaxed vehicles such as tractors and diggers as well as horticultural equipment and agricultural machinery. Rebated fuel can also power earth-moving machinery, piling and drilling equipment, cranes and static diesel-powered machinery; generators, pumps and industrial heating/cooling equipment. The applications of Red Diesel are widespread throughout the construction, civil engineering, agricultural, marine, leisure and commercial industries. The use of Red Diesel in road going vehicles as an ‘every-day’ fuel is prohibited by law. This particular diesel fuel is dyed red for easy identification by HMRC Inspectors, and anyone found to be using red-dyed diesel in a road-going vehicle is liable for prosecution. Crown Oil UK will only supply Red Diesel for off-road use or as a fuel oil. HMRC regulations require us to request all commercial and domestic users taking more than 10,000 litres a year (or a single delivery of 3,500+ litres), sign a declaration stating what the fuel is being used for. If your business is actively trying to lower your carbon footprint through greener initiatives. You may want to consider reading more about our Carbon Offset Red Diesel, which is a greener alternative to Red Diesel.